Natural light streaming through your ceremony windows on a fabulous fall day will make you smile like the princess that you are. In the northern hemisphere, fall officially begins on September 21st and ends on December 21st when the winter season starts. The natural landscape has a seasonal touch enabling couples to take advantage of the crisp air, beautiful leaves turning color, abundant acorns, pine cones, pumpkins, Indian corn, berries, cornucopias and gourds. Close your eyes and what pops into your mind when you think of autumn wedding colors? Vibrant reds, burgundy, orange, yellow, brown, gold and sage green are popular fall colors that dominate the autumn palate. Today’s modern brides are choosing chocolate brown with light blue accents. Can you imagine having your reception in an old stone house, an 18th century inn or town hall? Consider having a casual party in an old barn, vineyard, apple orchard or mill by a lazy river. If you’re hosting a more elaborate wedding reception, look for a room with an old, large, fireplace, lots of rich dark wood and if you find a place with stained glass windows that’s an added bonus. Fall wedding themes can easily be carried out by using decorations that are natural for the season. Have your guests enter your reception room by walking through an arch created with corn husks and wheat. If you’re on a budget, decorate the tables using potted mums surrounded with tea candles. 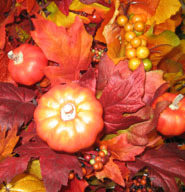 Other autumn centerpiece ideas that are a hit include, a carved out pumpkin filled with dried fall flowers or candles. 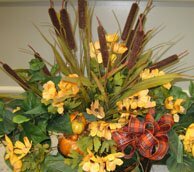 If money is not an object, ask your florist to create a centerpiece incorporating pine cones and acorns along with your fresh flowers. 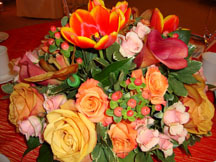 You no longer are limited to your local geographical location for your flowers. With today’s creative shipping techniques and exotic greenhouses, virtually any flower can be flown in for your wedding day. You will pay a premium for these services; just know that they are available to you. A beautiful array of harvest hues and textures include: mums, hyacinths, ginger spice Leonidas, roses, red Asiatic Lilies, brilliant orange Peruvian Lilies, deep peach roses, pincushion protea, yellow calla lilies, yellow yarrow, red mini matsumoto asters, solidago, along with lush green eucalyptus will offer a warm choice for fall wedding theme flowers that can be used for the bouquets and centerpieces. 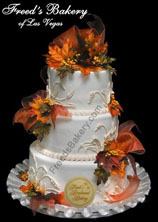 You can enhance your autumn motif by serving a cake that is decorated with some of above flowers and placing dried leaves around the base of the cake. Consider a carrot or spice filling. There are so many options to consider when choosing your fall wedding menu. Choose a hearty meat dish as an entree like roasted turkey, quail, and filet mignon. For side dishes choose roasted or mashed potatoes and squash. 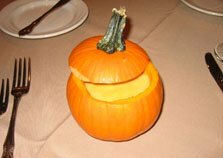 Pumpkin soup served in a hollowed out pumpkin will make quite a hit with your guests. Apple or minced pie can also be served as dessert. Your vegetarian eating guests can have a choice of sword fish, filet of sole or snapper as their main entrée. Their sides could include: scalloped potatoes, green beans and of course, the ever to popular broccoli. Fall weather is usually cool and crisp but it can also be hot and humid or rainy, so be prepared by having extra umbrellas, lots of hair spray, and a wrap. These are just a few thoughts for fall wedding themes. Please check out my other ideas and tips on the links below. We all need help every now and then, so why not let me do your leg work for you. Visit our Welcome page and get some great ideas to create a magical, memorable wedding.